• Support steady energy production. contains elemental magnesium chelated with the amino acids glycine and lysine. As an essential dietary mineral, magnesium plays important roles which include: helping cells produce metabolic energy, supporting optimum nerve function, helping muscles relax properly and maintaining a healthy heartbeat. Glycine has been shown to be an efficient carrier for minerals that facilitate absorption in the intestine tract. Glycine is used by the body to form collagen, a key protein in cartilage and connective tissue. Lysine is an essential amino acid that assists gastric function. Women who take both synthetic estrogen and calcium supplements may be at risk for low blood levels of magnesium.7 Estrogen promotes the transfer of magnesium from blood to soft tissues. Low blood magnesium may result if the ratio of calcium to magnesium intake exceeds 4 to 1. 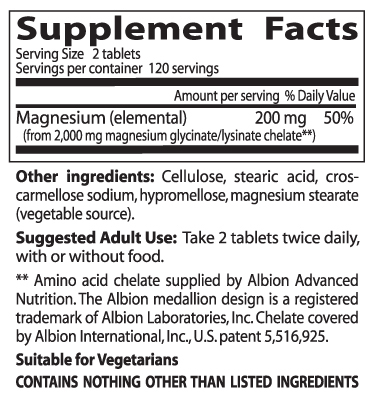 Magnesium supplementation is thus advisable for women taking estrogen and calcium. Magnesium has been consistently depleted in our soils. It has been further depleted in plants by the use of potassium and phosphorus laden fertilizers which alter the plant's ability to uptake magnesium. Water from deep wells supplies additional magnesium not found in food, but surface water, our common source of supply, lacks magnesium. Food processing removes magnesium. Broiling, steaming and boiling remove magnesium into the water or drippings. High carbohydrate and high fat diets increase the need for magnesium as does physical and mental stress. Diuretic medications and insulin further deplete total body magnesium. As we age magnesium uptake may be impaired. Dieting reduces intake of already low levels of magnesium intake. Recent research, in France and several other European countries, gives a clue concerning the role of magnesium plays in the transmission of hormones (such as insulin, thyroid, estrogen, testosterone, DHEA, etc. ), neurotransmitters (such as dopamine, catecholamines, serotonin, GABA, etc. ), and minerals and mineral electrolytes. This research concludes that it is magnesium status that controls cell membrane potential and through this means controls uptake and release of many hormones, nutrients and neurotransmitters. It is magnesium that controls the fate of potassium and calcium in the body. If magnesium is insufficient potassium and calcium will be lost in the urine and calcium will be deposited in the soft tissues (kidneys, arteries, joints, brain, etc.). Magnesium intake is tied to skeletal bone health through several pathways.15, 16 Under normal physiologic conditions; parathyroid hormone (PTH) secretion is low when magnesium intake is not adequate. Abbott, L.G. and R.K. Rude, Miner Electrolyte Metab, 1993. 19 (4-5): p. 314-22. Barbagallo, M., L.J. Dominguez, and L.M. Am J Ther, 2007. 14(4): p. 375-85. Marier, J.R., Magnesium, 1986. 5(1): p. 1-8. Guerrera, M.P., S.L. Volpe, and J.J. Mao, Am Fam Physician, 2009. 80(2): p. 157-62. Costello, R.B. and P.B. Moser-Veillon, Magnes Res, 1992. 5(1): p.
Durlach, J., et al., Magnes Res, 1998. 11(1): p. 25-42. Seelig, M., Magnesium Research, 1990. 3: p. 197-215. McLean, R.M., Am J Medicine, 1994. 96: p. 63-76. Graber, T.W., Comprehensive Therapy, 1987. 13(1): p. 29-35. Sueta, C.A., J.H. Patterson, and K.F.J. Magnesium Research, 1995. 8(4): p. 389-401. Classen, H.-G., Magnesium, 1986. 5: p. 105-110. Sontia, B. and R.M. Touyz, Arch Biochem Biophys, 2007. 458(1): p. 33-9. Al-Delaimy, W.K., et al., J Am Coll Nutr, 2004. 23(1): p. 63-70. Nielsen, F.H., et al., J Am Coll Nutr, 2007. 26(2): p. 121-32. Rude, R.K., F.R. Singer, and H.E. Gruber, J Am Coll Nutr, 2009. 28(2): p. 131-41. Musso, C.G., Int Urol Nephrol, 2009. 41(2): p. 357-62. Tucker, K.L., et al., American Journal of Clinical Nutrition, 1999. 69(4): p. 727-736. Saito, N., et al., Journal of the American College of Nutrition, 2004. 23(6): p. 701S-703S. Carpenter, T.O., et al., J Clin Endocrinol Metab, 2006. 91(12): p. 4866-72. Stendig-Lindberg, G., R. Tepper, and I. Leichter, Magnesium Research, 1993. 6(2): p. 155-163. Pineda, O. and H.D. Ashmead, Nutrition, 2001. 17(5): p. 381-4. Adibi, S.A., J Clin Invest, 1971. 50(11): p. 2266-75. Ashmead, H.D., Graff, D., Ashmead, H., 1985, Springfield, Illinois: Charles C. Thomas. NNFA Today. 1996. p. 15.